The Nvidia GTX 1080 and 1070, Intel's Broadwell-E, and more new PC hardware. We're here in Taipei's smoldering weather, geared up and ready to bring you coverage of all the new hardware goodness at Computex 2016. The trade show started today with an opening press conference: gaming got a mention, and all the usual suspects will be showing off gaming hardware this week. There's even Twitch-streamed overclocking competition. In fact, overclocking has become so serious that it was touched on by Taitra's VP during his opening Computex keynote. During the keynote Q&A, I asked the panel of Computex organizers what they thought the impact of cloud gaming might have on manufacturers producing gaming hardware. Companies that make say, motherboards, graphics cards, etc., all have their minds on what the future of the gaming desktop might look like. The answer? There are an increasing number of companies producing gaming hardware, and gaming is a huge part of Taiwan's economic growth. However, they didn't have much insight to offer on what the ramifications will be once cloud gaming goes mainstream. This is entirely understandable since the promise of cloud gaming is still far away. The success of it is incumbent on the development of faster internet access infrastructure and network related hardware. The press conference is also where Computex highlights its design & innovation award winners, and there were a few cool gaming products among them. We've highlighted the most interesting ones below. It's all stuff we've seen before, though—the real action kicks off tomorrow when we hit the show floor. So what should you expect from Computex this week? 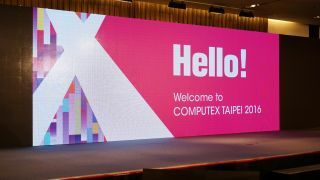 Computex is traditionally a show for buyers, so there's going to be an ocean of actual hardware on display on the convention floor. We'll get to see everything from motherboards, to SSDs, to gaming accessories and likely more VR HMDs. But Computex is also a great place to find odd and obscure hardware offerings. AMD is set to make an announcement this Wednesday. From what we know, it looks like there's going to be a new CPU on the way, given that its Polaris GPU details were given out to press over the past weekend. No details have been given by AMD yet, but we have a pretty good hunch it's going to be an APU with a focus on power efficiency. It could also be likely that the new chip will have Polaris architecture embedded. We'll find out more on Wednesday. The last major announcement we're expecting to hear more about is going to be Intel's new Broadwell-E chips. Intel is poised to unveil at least 4 new CPUs for the desktop, and all of them will be Extreme Edition chips. This means we're also going to see motherboard companies like Asus, Gigabyte, MSI, etc., all announce refreshes of X99 motherboards. Then there's Nvidia's GeForce GTX 1080 and the newly announced GTX 1070. All the major board players will no doubt have their own variations of Nvidia's new flagship GPU to show. You can also expect price variations too, and we're expecting offerings to be cheaper than Nvidia's own Founders Edition. That's just the start of what we'll be covering at this year's show. Here's a look at some of the cooler PC gaming gear from Computex's d&i awards. ASUS gets a bit more serious with system integration in 2016, competing head on with some of its closest partners. The company showed off its ROG GT51 gaming system, which is essentially a bunch of ASUS-made parts housed inside a custom case with ROG styling. Although the ROG GT51 took home an early Best of Computex 2016 award, it was powered by dual GTX Titan X cards, rather than Nvidia's latest GTX 1080. Other than being powered by an unnamed Core i7, ASUS didn't list any other details. But that's okay, because if you're a fan of ROG styling, the GT51 definitely looks badass. Zotac also took home at least two awards this year, one for its Zbox MI545 nano small integrated PC as well as the Sonix PCIe SSD company's first PCIe-based SSD. Zotac pitches the Sonix as an SSD for gamers, but it's really for anyone who wants an ultra fast OS drive. Cooler Master has doubled down on its Master series of products, first started with its series of highly modular Master cases. Its MasterAir Maker 8 won an award for both efficiency and relatively simple design. Cooling products always come out in larger numbers at Computex, and this year there will be even more. Companies will often have full booths entirely dedicated to CPU and GPU cooling. Asus took home the only award for a motherboard this year with its popular X99 Deluxe II. All major board players are unveiling new options this week as Broadwell-E makes its official appearance at the show. As usual there will be more options than you can shake a stick at, and you can bet that a large number of them will come with GRB lighting. We're expecting to see a flurry of new X99 refreshes. There's a new switch on the keyboard scene. Called Flaretech, the Cherry MX-compatible switch utilizes an optical sensor instead of a mechanical contact. It's still mechanical in the sense that you push down and receive feedback, but the optical sensor claims to solve things like double-tap errors, and offer faster response. Adomax, the company behind the Flaretech switch says keyboards with its new switches can endure over 100 million key actuations. We'll find out more about how this switch works soon.